Anne Woodhull, Director of The After School, leads childrens' groups investigating farm life and the natural world. 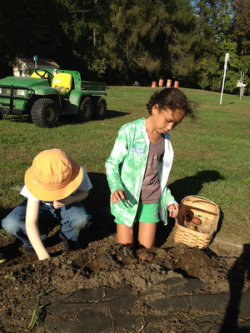 The After School also offers individual programs for children at Bramble Hill Farm and A.P.E. by appointment. My aim is to create a protected space that feels like a refuge and a “tool box”. The aim is for a child (and adult) to feel inspired to play and make, and that the space itself helps create the right circumstances for what that person might need to find out about themselves. There is a table for making things, there are paints, different kinds of paper, sewing things, fabrics, wire, clay, modeling wax, wood, marbles. There is junk, old machines, hammers, nails, soft stone to carve. There is a corner of shredded paper for making a nest, or burrowing in and hiding or jumping into. There is a place to move, with a swing, hanging ropes, a sail suspended from the ceiling so they can float. There are large balls and small balls. There is a large sand box for playing in. There are two small sandboxes with many figures collected from all aspects of life(trees, cars, people, boats, mythological creatures ect.) People can take the small objects and make stories in the sand. All these "tools" create possibilities for making concrete what is inside someone. And in the succession of sessions a story emerges, particular to each person. It is in this unfolding that a depth of question, difficulty, affirmation, fun, and surprise appears. And slowly, through these discoveries of the new, the story reveals its value. For more information please contact Anne Woodhull (413)253-8903.